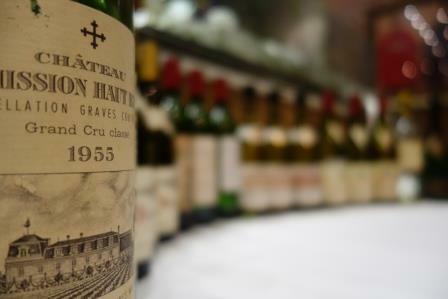 1955 Bordeaux wine remains one of the better, older, mature vintages. Strong wines were produced from the Medoc, Pomerol, St. Emilion and Pessac Leognan appellations. The 1955 Bordeaux wine growing season enjoyed warm, dry and sunny conditions. In fact, the summer was close to perfect. It was hot for most of June, July and August. Some rain fell in September, but the rain came at right moment and helped the dry vintage to reach maximum levels of ripeness. 1955 Bordeaux wine is the result of an above average sized crop. 1955 Bordeaux wine produced wines of high quality on both the Left Bank and the Right Bank. In fact, the wines of Graves were also strong. The wine of the vintage is clearly Chateau La Mission Haut Brion. However, Chateau Mouton Rothschild is not far behind and as should be expected, Chateau Haut Brion is right up there in quality as well. In a recent tasting, Chateau Ausone performed well and the 1955 Chateau d’Yquem was a knockout!